Purpose: In this tutorial you will get a closer look to XML standard and accompanying tools, as well as to exciting XML format. XML (eXtensible Markup Language) is a convenient and self-explanatory presentation (markup) of data for both humans and computer programs. This principle fits perfectly to materials science and physics domains, where the data are crucial to be unambiguous, clear and easy to process and alienate. XML distinguishes data and metadata. The metadata are the shape of the data or the data about data (μετά means adjacent in Greek). Let's have a closer look. The typical input for an exciting calculation is provided below. The metadata are elements (called tags) in the brackets. Data are surrounded by metadata, so one can distinguish and systemize the information. Note the first 3 lines announcing tech info about used XML dialect, stylesheet and schema (we will return to them later). The meaning of certain tags and attributes is given in Input Reference. Assuming you have no preliminary knowledge about exciting input, isn't it quite clear? If you are familiar with HTML, you also already may have noticed the similarity. Indeed, HTML is a subset of XML, suited for information markup in web-browsers. XML is the only way to define an input for exciting calculation, whereas the output data are generated in different formats: XML, binary and plain-text for compatibility. Note, that every exciting input always contains at least structure and groundstate elements inside the input root element. XML provides the key abilities drawing its popularity: schema validation and stylesheet transformation. Let's get acquainted with them. Every XML file implies the convention (i.e. schema) on how the certain XML tags inside should be used (e.g. <relax> but not <optimisation>). This schema was determined by the third line of our example XML file above (xsi:noNamespaceSchemaLocation attribute). We can automatically validate any XML file according to the schema it complies: this is a built-in XML feature. Schemas are given by the schema-definition XSD-files, for exciting input this is excitinginput.xsd file. Congratulations: you just assured that you are dealing with absolutely valid XML input of exciting. Now try to spoil the input somehow, e.g. simulate a typo: is the input valid anymore? Basically, the usual web-browser can be also thought as an XSLT-parser, rendering HTML code (subset of XML) at the screen with some pre-defined templates. 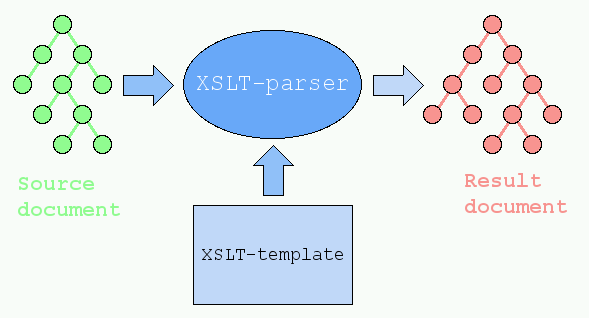 The main deal in the XSLT transformation is to provide an XSLT-template, which is a XML-like file with .xsl extension. 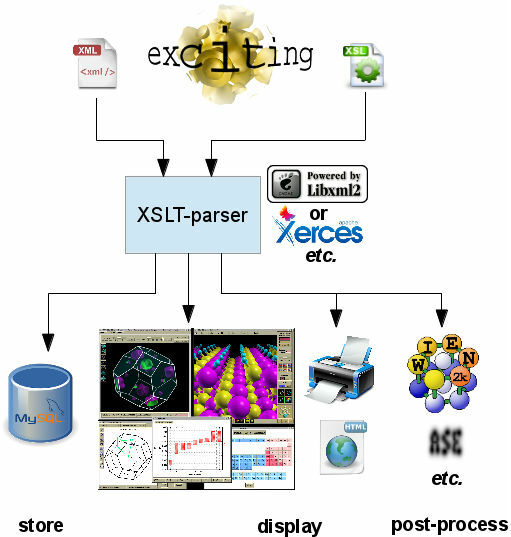 Lots of XSLT-templates are already shipped with exciting: check out the $EXCITINGROOT/xml folder. A Template Market for various processing of exciting XML data is also at your service! If you feel comfortable with programming, you will also find quite easy to deal with XML (parse, generate, validate, transform etc.). Every programming language either has an interface to the above-mentioned libxml library or implements its own XML parser. On an example of Python we will perform XML validation and transforming described above. Python has yet even several interfaces to libxml, and that called lxml is used below. On UNIX this chain of tools (i.e. Python interpreter + libxml + lxml) is likely to be present already in your system, for Windows there is a great portable Python pack including them. and assure the tasks we've done before by typing in command line can be performed by these scripts. More advanced example can be given, using ASE (Atomic Simulation Environment) Python library interfaced with exciting. ASE is an external library, requiring an installation (although it is possible to save it simply to a subfolder and import from there). and proceed only if you see no errors. exciting calculation setup along with the desirable band plot (calc_obj variable). Then the script generates needed XML input automatically with an immediate launch of exciting. cmd = "/usr/global/mpi/bin/mpirun -np 4 " + os.environ['EXCITINGROOT'] + "/bin/excitingmpi" # edit accordingly! Run the script and pay attention, how all the needed XML files are generated on-the-fly!